The mummy on the cover of this book draws immediate attention to this selection and invites the reader to take a look inside. 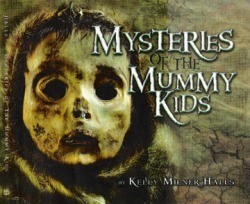 Then mummies permeate the pages of this well-researched and highly informative nonfiction title. The intrigue comes from the idea that there are mummy kids who have been discovered in South America, Egypt, Europe, Asia, and North America. History of the people from each designated area enhances the text and offers a view into why and how certain children may have come to be mummies. Vivid and well-captioned photos move the story along and information about archeologists and scientists who have found and researched the mummies is important. Added highlights include interviews with a mummy finder and paleopathologist and an explanation of how a mummy face can be used to reconstruct the face of an actual child and how a perfume scent was created based on a mummy mask. This book is rich with information for report gathering. It can be used to supplement studies about various areas and cultures of the world. Text is extensive, thus the suggested audience of 12 and up, but photos may be enjoyed by younger students. Hall's style and attention to detail make this a quality book for all schools. This is a Junior Library Guild selection. Halls presents an eerily fascinating exploration of mummified children and teens found in South and North America, Europe, and Asia, clearing up the misconception that mummies are Egyptian only. Photographs show clothing, items buried with the mummies, and even final facial expressions while CT scans help tell the stories of how the children lived and died. Some were apparently proud sacrifices to the gods, some the victims of disease or violence, and others mummified naturally, such as those "evicted" from their graves in Mexico after their families failed to pay a death tax. Mexico has an entire museum housing these mummies-a perfect fit with the annual celebration of El Dia de los Muertos (The Day of the Dead). Naturally most remains are skeletal, but others appear almost lifelike. An Italian toddler mummy looks as if she will awaken at any minute. Interviews with anthropologists and one paleopathologist reveal the need for patience and expertise in searching for, excavating, and transporting the fragile bodies. 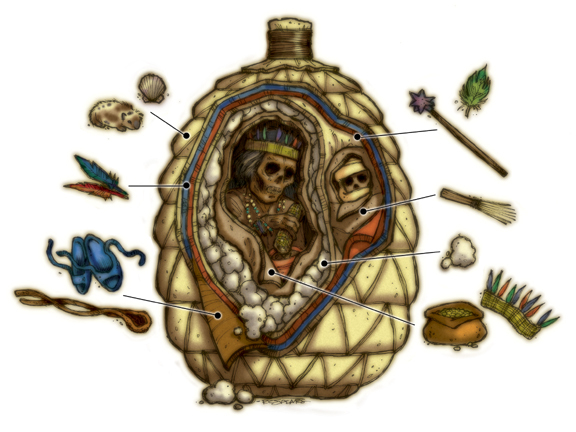 The final section provides information on modern mummification methods available to those able to spend a lot of money to preserve themselves or their pets. A list of contact information for museums with mummies on display is supplied. The writing style is plain yet absorbing, presenting scientific and historical information in simple terms. Bonus features such as how a chemist recreated the scent used on an Egyptian death mask make this a fine addition to collections. It is best used as a supplemental report source or browser. Gr 4-8 With the unique perspective of focusing on child mummies throughout the world, this title adds to the growing cadre of books on the topic. Using an accessible combination of scientific language and layman's vocabulary, Halls builds a strong understanding of the possible reasons for mummification; describes various processes of preserving human remains, both accidental and intentional; and introduces the people who made important discoveries and the scientists who are working to learn more. 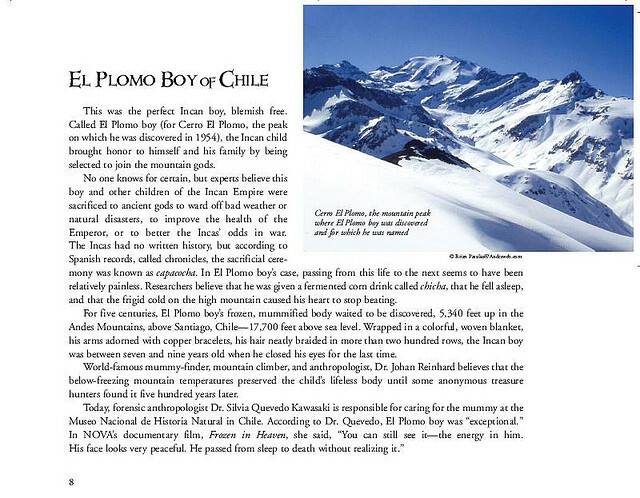 Beginning in South America, the author explains how particular youngsters were chosen as sacrificial gifts to the gods, and then proceeds to discuss mummies from nearly every continent. Interviews with researchers and modern-day explorers punctuate the well-written narrative and lend an air of authority to the book. High-quality full-color photographs are used effectively throughout and provide a visual understanding of the text; they serve as a lure for students who are drawn to the more gruesome aspects of the subject. An excellent glossary, a thorough bibliography, and listings of museums with mummy collections are all appended. Pair this with titles such as Shelley Tanaka's Mummies (Abrams) or Sandra Markle's Outside and Inside Mummies (Walker, both 2005) for an up-to-date look at this fascinating aspect of archaeology.